THz radiation is the wavelength domain between radio waves and optics with frequencies from 100 GHz to 10 THz. Due to the large wavelenth (few mm) resonators can be manufactured with very well defined spectra. This allows for a straight forward study of coupling of spectrally identical resonators Optics Express 2014, also called photonic molecules. High quality resonances can still be achieved even if a small hole is punched into the resonator Optics Express 2013. In order to couple efficiently into WGM resonators dielectric rod can be used IEEE 2015. 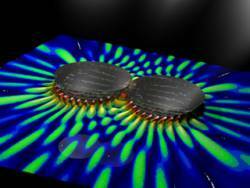 Whispering gallery mode resonators allow the tight confinement of both THz and optical radiation. With high quality confinement, the electro-magnetic field strength can get large enough that within a nonlinear material both wavelength can interact. We have proposed to use such a triple resonant system for sensitive detection of microwave and THz radiation Phys. Rev. A. (2009). We have furthermore shown theoretically and experimentally that the sensitivity can be so high that such systems could be used to detect the cosmic microwave background or be used for studying the temperature in the upper atmosphere Optica (2018).